Sparks fly when these three masters of the flatpick combine forces! Scott Nygaard, Jody Stecher and Eric Thompson have collaborated in various combinations (most recently as part of Kleptograss) and now are performing as a trio called "Guitars Without Borders." Guitars will be front and center, of course, but they play other instruments too — mandolin, fiddle, banjo, maybe some cuatro — and Jody’s soaring vocals are part of the mix as well. 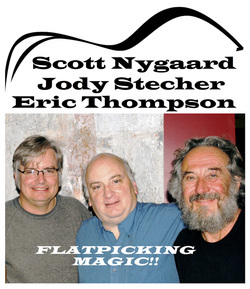 The repertoire could come from almost anywhere including the fertile imaginations of Jody, Eric and Scott – these virtuoso pickers started with bluegrass and old-time music, but they have also delved into jazz and swing, Irish and Scottish, Cajun, blues, Puerto Rican, rembetika, Balkan, etc. etc. Scott, Jody and Eric have worked with too many notable musicians to list here, but some of them are: Peter Rowan, David Grisman, Chris Thile, Joan Baez, Mike Seeger, Tim O’Brien, David Nelson, Jerry Garcia, Maria Muldaur, Laurie Lewis…you get the picture.